I love my job. Really, I do! I look forward to getting to the office and knowing that my actions from that day will ultimately help people lead more healthy, active and fit lives. But, when it comes to actually working out myself…well let’s just say it wasn’t love at first sight. You see, as a kid I was into computers and gaming—which is a nice way of saying I didn’t lead an active lifestyle and was (as much as I’d like to deny it) a chubby kid. In fact I remember clearly my first mile time in high school: 15:27. 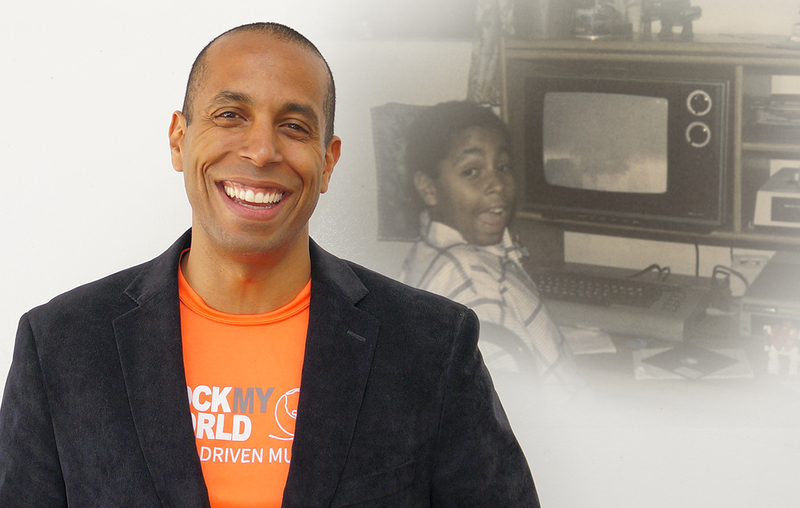 So how did I transition from a chubby kid to the founder and Chief Rocker of a fitness and music app? After college, I spent years as a club DJ, traveling around and witnessing first hand the powerful effect music – the right music! – could have on people. Eventually the party life wore on me so I went back to school and threw myself into earning an MBA and by 2006 was working at Qualcomm a Fortune 500 technology company. I tried to stay active, but like many people was plagued by a lack of motivation. So in 2008, I decided to kick start my fitness and signed up for a half marathon. Just as I expect you do, I relied heavily on music to keep me motivated, distracted and moving forward mile after mile. However during my training I found myself increasingly frustrated by the lack of enjoyment from my running music. Randomly getting a slow tempo song on Pandora or from my own playlist was a motivation killer. Plus the intro and tail of each song felt like they each lasted hours and dampened my attitude. I thought: There has to be a better way! I reflected back on my time as a DJ, and how over the course of night I could build the crowd up into a frenzy, by playing the right song at the right tempo at the right time. So I decided to put my DJ skills to work and for the actual half-marathon, I crafted a DJ-style mix. Every song flowed seamlessly from one to the next and because I had a goal time in mind and I knew from my training when I would need an extra kick of motivation, I tailored my mix with so that it would match how my body would feel. The mix worked like a charm, and as I crossed the finish line to “All I Do is Win” blasting through my headphones, I felt invincible! I never would have thought that the chubby computer-nerd kid who had a 15+ minute mile time in high school could run a 1:50 half-marathon. It was that moment that spawned the RockMyRun you know and love today. The idea that the right music, at the right time, played the right way, can help people accomplish goals they never thought possible is what drives me every day. Well, that’s my story… but I want to leave you with one final note. Whether you’re a 10x marathoner or this is your first day working on you, it’s never too late to start enjoying fitness more. That’s our aim with RockMyRun and we’re excited to join you during your next workout! Do you have a story to tell? I’d love to hear it and so would my team. Send it to adam@rockmyrun.com. We’d love to know more about your journey. Damien – RockMyRun will work with 3G as well, but it does require data to use. Like Pandora and others, RockMyRun is a streaming music app. Hope this helps! Hi Chief Rocker, I love what you have introduced to all of us fitness experts that need excellent music like this. living in Marrakech sometimes can be a little difficult when searching for good motivating music for my clients. Thank you, thank you please keep going and keep smiling we love it. Thanks for the mix. I’ve spent so long downloading running trax that just don’t cut it and the predictability of what I might here from my own music list is what made me choose your app. Thanks Amanda! DJ Mike Czech did a great job with one, glad you enjoyed it! I thank you for your kindness of the message you have given me.i hope to have more nice songs from you. Loved reading your story! I think rock my run is a fabulous app, yet I haven’t quite found my genre…I’ve tried various ones but need more of artists like Ed Sheeren, Jack Johnson, Phillip Philips, Maroon 5, Dave Mathews, John Mayer, Passenger…I guess, one would have to say softer, or indie…thanks for listening! We don’t have a ton of mixes with those artists as most of the mixes tend be higher energy. But we always love hearing what people would like to hear! I’ll let our head of music know to incorporate more of these artists into our mixes. Thanks for sharing! I just love the right music for a run or workout on my elliptical machine and with every new day there is a different mood. You got it right and its so easy. Thank you! My trainer suggested this app – I am training for my first half marathon. I LOVE it-thank you sooo much!!! Absolutely love the mixes on this app. I was listening to a few last night and I was motivated to run right then and there but it was 11pm and running outside would have not been the greatest idea. Can’t wait to test it out later today! I have to have good music to run to or I can’t do it, plain and simple. Love your app, love the wide variety of music, and I’ll spread the word! I’ve tested it today. It simply ROCKS!, Great mixes! I’ve found mixes with exactly the kind of music I like… Adam, you go places! Oh yes! Please send us your photos and enjoy rocking out during your workouts! So much fun. This is just what I’ve been hoping for. Finally heard every song on Pandora in my 100 stations and couldn’t stand it anymore. Nothing quite right. Thank you, Rock My Run! Fantastic! Feel free to shoot us a note anytime and connect with us on social media to keep us posted on your fitness goals! Love this app! I like that I can choose a different genre each time if I want and the music stays on tempo! I am going from being an on/off runner to a goal of running 1000 miles this year! I am going to need this app for sure! Thank you for offering a Free version!! Wow! That is one BHAG! Good for you and thanks for taking us along for the miles! Do us a favor and please post your progress to our Facebook, Twitter or Instagram accounts. We would LOVE to keep up with how you’re doing! RockMyRun now blasts through IFit on my NordicTrack……..SAWEEEEET!!! Thanks this makes it all the easier with a library full of the best mixes and jams. Got the recommendation from my brother out on the east coast to check out your app. Love it! Downloaded it, put it on while getting ready for the gym, did my track run and stairmaster… And recommended the app to friends in Chicago (where I’m from), friends in San Jose and a group at the gym. So glad my brother tuned me in! I googled music to run to and your ad popped up so I subscribed and I am so thankful I did ! It made me not want to stop my run and I want to go back every day just to listen to it !! It motivates me beyond belief !! Thank you so much !!! We are so glad you did too and are happy to hear RockMyRun is motivating you to power through your workouts 🙂 Thank YOU for giving us a try! I read about this app from my Weight Watchers magazine. Can’t wait to try it! Listening to music while I’m out walking or exercising at the gym not only motivates me but let’s me “get out of my head” for a time. I’m excited to hear new music instead of my usual playlist. I just took my first run using the app. I love the available variety. Using other apps like Pandora I was constantly hitting the “next” button. With Rock my Run I was able to focus on the run instead of trying to find the right song. We are so glad to hear that you are enjoying the music! Our goal is to keep you moving and motivated, so you can focus on your workout :). Rock on! I’ve started to use this app only a week ago,but I already adore it! I just simply can’ t imagine my workout without using it. Go ahead, you are awesome! Wish the best for you guys !!! Great app used it only once but look forward to checking out the different genres and seeing which one inspires me to keep moving the most. The best invention since sliced bread, but I don’t eat bread, so the best thing since the invention of google! 😉 I’ve been looking for exactly this. Thank God my trainer told me about it. I’m sure I will tell everyone about this app!!! I just got back into training again and discovered Rock My Run… I love it! It give me motivation that I was lacking. Some days it is hard to get myself in gear. Thanks for keeping me going. Hi Adam! I just wanted to say a huge thank you to your work! Your app is simply amazing!! I used to be barely able to run even 1km 😂😂 your music has enabled us “unfit” people to run much more than we ever thought we could 🙂 thank you so much!!!!! You’re so welcome Jen. Keep up the great work! If you keep at it, you’ll feel sooo good as you continue to set new records for yourself. It can be challenging, but it’s so worth it. First time I used it was yesterday and loved it. Tuned into Prince music and nailed my workout like never before. Hoping to reach my weightless goal by Aug for my 38th class reunion and to get on the road for a healthier lifestyle. I downloaded it yesterday and played with it for about an hour! Can’t wait to use during my workout! This is genius! Awesome design and has a great feel to it. I love the different mixes! And my favorite part… it being seamless thru each song! Like I said, genius!! Thank you Tamara! I hope you’ve had a chance to get out there and use it. The seamless part really makes a difference and wouldn’t be possible without all the talented DJ’s who contribute to our service. Big shout out and thank you to them! Your app is just awesome. I was hooked from the beginning. I hate switching channels during my runs. Oh, SDSU, aztecs for life. Thanks for sharing your story. I’m so happy that you took the time to make an app that helps people stay motivated when they run. I started to notice at track and cross country practice I would often times get bored when I was running the long distance,usually around the three mile mark and it made it hard to keep pushing myself to not give up. I downloaded rock my run recently and I’m still figuring out all the different choices,I haven’t found a track that is perfect,but all the ones I have tried keep me going and have made running easy and enjoyable. thank you so much for sending the email thank you and for attaching the link to see you and your inspiring story. It is such a blessing to see you and know that an active life is doable with great music. I know color/race shouldn’t matter but most times it does. To see a man of color founding Rock my Run makes my heart proud and it says anything (great things) are possible. I will use this app even the more. May you be blessed and thank you again. Looking forward to a more active life with Rock My Run and I will tell all my family and friends about this helpful tool towards great fitness. This app is recommended on Run,Zombies! Another great running app…together they are great! I enjoyed reading your story. I recently downloaded your app– honestly just to see what it had to offer. Boy, was I pleasantly surprised! My son loves how you can change the tempo. And, I can’t wait to start training for my 1st half marathon! Dear Adam…YOU…DONE…GOOD! Grandma Lisa is off the couch working out again. Thank You!!! Love your story, Adam! Unfortunately, I cannot anymore due to a new titanium knee “installed” this May. And now I have a broken ankle! BUT, I can still pedal a bike, so Ivam going to use your app to listen while I ride instead! Thanks for the motivation! Happy holidays! I meant to say I cannot RUN anymore! Ugh! Adam!!! Amazing. My favorite app by far. Nothing is worse than being tired of your music or Pandora and worse, having it demotivate you during work outs. This makes not want to stop running. Enjoy! I LOVE your app. Lots of great songs, easy to use, and reasonably priced. Thank you!! Thank you for your hard work and dedication! Motivated by the great mixes that me pumped for my high intensity classes. The better the music the greater the workout. Thank you! Keep on rockin!!! I’m really motivated by this app I do it w my app C25K and it is a motivation beyond measure!! I have always been a little chunky but when my dr said I was morbidly obese my heart sank… I would never consider myself that but it made me think and my older sisters who have always been bigger than me had weight loss surgery after losing so much on her her own before that is now smaller than me and is handing me her old clothes it definitely dug at me so I’m motivated for a life change.. thank you for sharing your story hope it inspires more people in the same way!!! I enjoyed reading your article. It is very motivating. Congratulations on your success and helping others be successful! Really cool story, Adam! It is inspiring to hear the story of a DJ->business person->runner, and now combining all three passions into one to benefit others! I started 8 weeks ago to get 5K in 45 minutes. I am doing High Intense Interval Training about a year, but I don’t feel the change. I get more muscles, but my health doesn’t improve. Last Saturday I was exercising for my big test that happened on Wednesday and I flipped my foot, bad. Wednesday came around, I got my foot taped in, took a nurse to the exam to run with me, and finished in 37 minutes. I was so proud of myself. I am so proud. Resting my foot for a minimum of 2 weeks now, because running with it, was very stupid, but I am motivated for the first time in a long time to be healthier. I just joined Jolt today, he is a funny and loving bot. 🙂 Love him already. Thank you for your great music that keeps me happy while running. You seem like a nice man that is warm and friendly. Best of luck with this app. So far so good! Music is so motivating and you provide some of the best mixes I’ve ever heard 🙂 Very motivating! I literally found your app the night before a 5K race. With the help of your music app, I rocked the race! Thank you for putting this app together. I love it and will continue to use it on all my runs and races. So glad I found it. Thank you! !